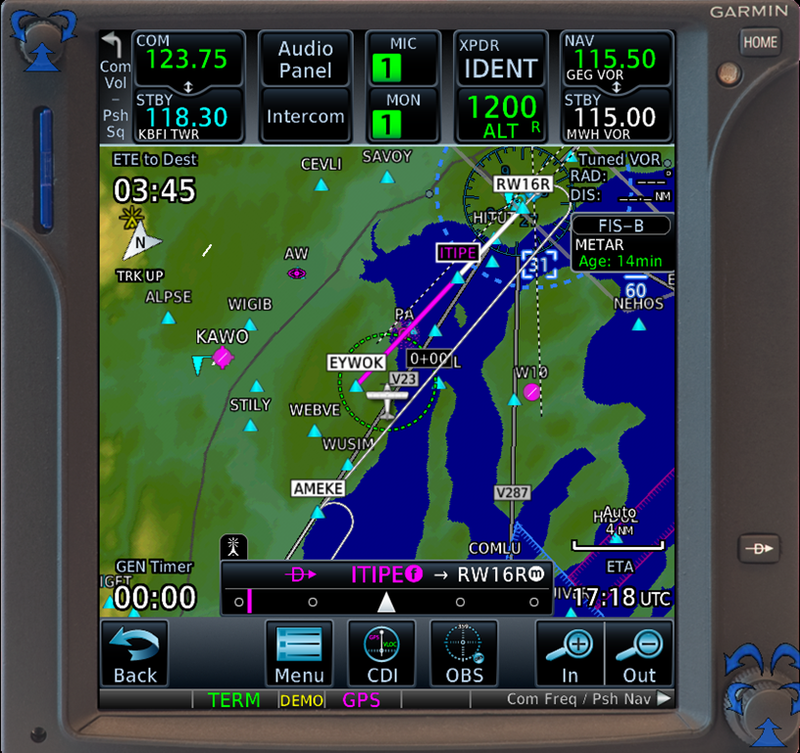 Garmin has released updated system software (version 6.11) for the GTN series of navigators. The software includes several new features. 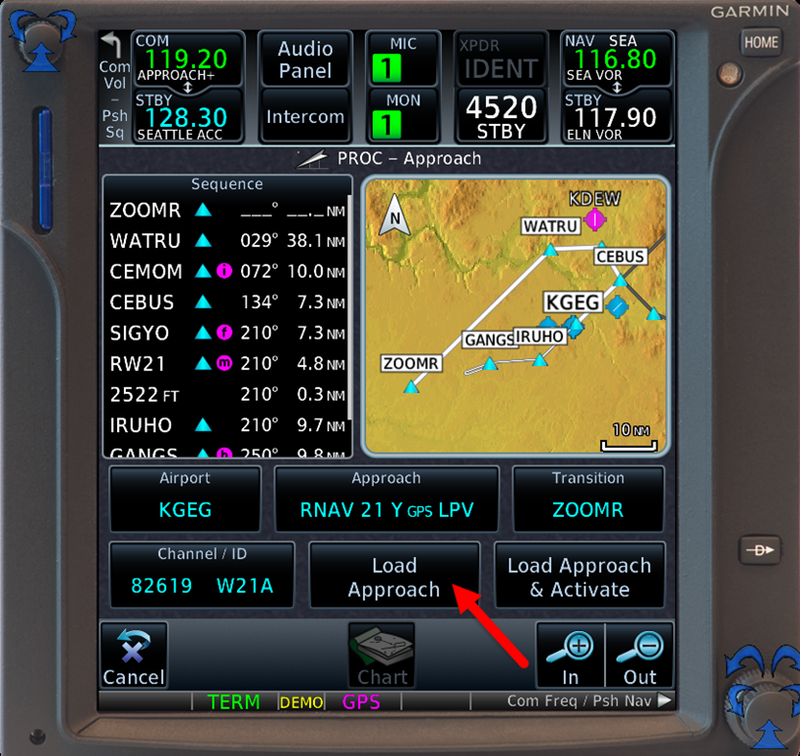 One of the changes, at least for day-to-day operations for typical general aviation pilots, involves the behavior of the vectors-to-final option (VTF) available when loading an approach. 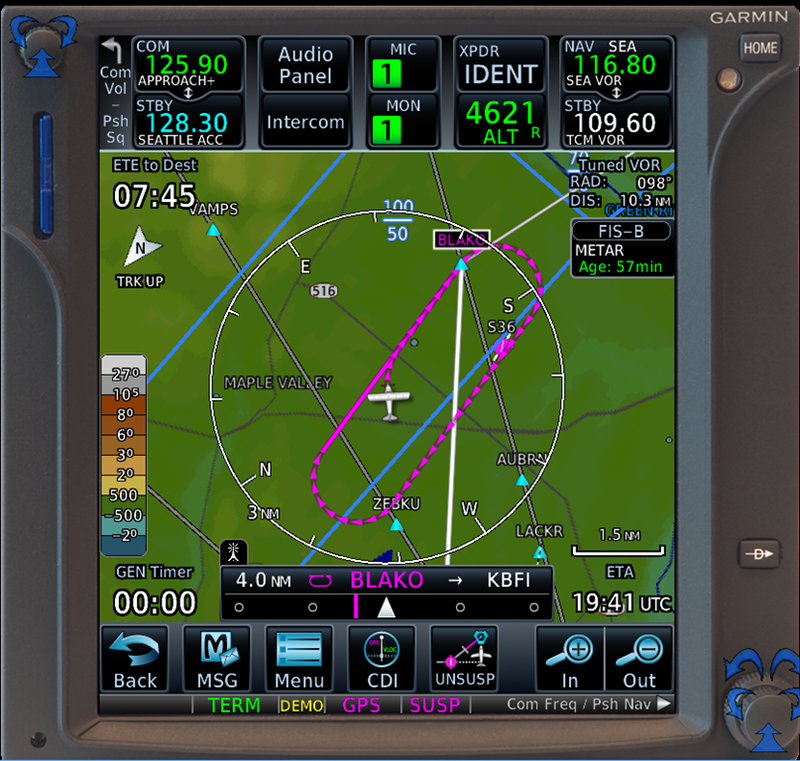 To learn about and practice using the new features in GTN system 6.x, download the latest version of the free GTN 750 PC Trainer Lite from Garmin. 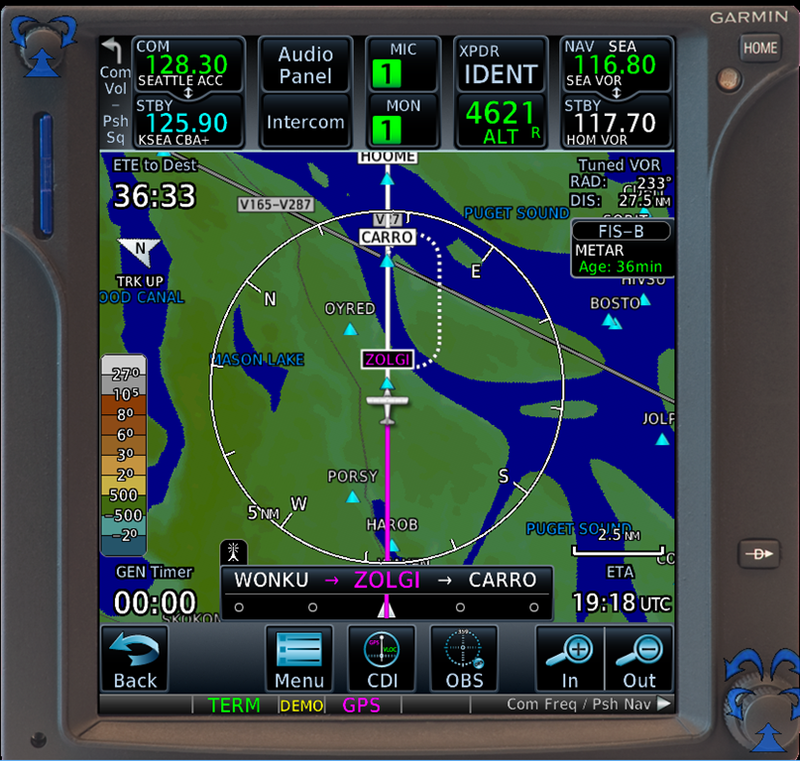 The download includes updated manuals (PDFs) for the GTN series avionics that describe the new features in version 6.x. 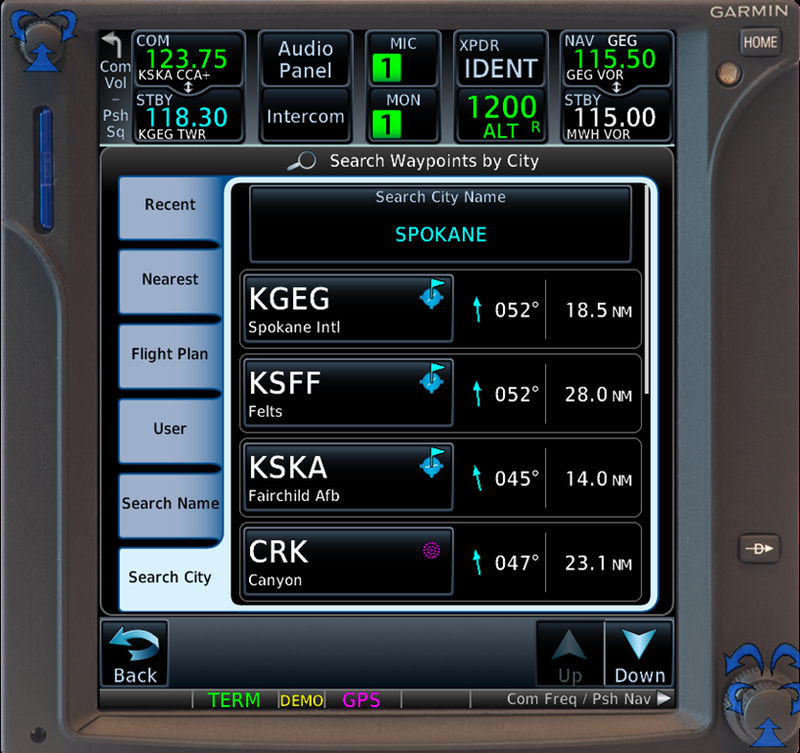 When you load an approach into your IFR GPS box and choose Vectors-to-Final, the computer typically erases all fixes except the FAF and the MAP, making the snazzy moving map far less useful as an aide to situational awareness. Vectors-to-Final also may lead to a frenzy of knob turning and button pushing if ATC unexpectedly clears you to an IAF or IF instead of setting you up on a heading to intercept the magic magenta extended centerline that Vectors-to-Final draws on your screen. 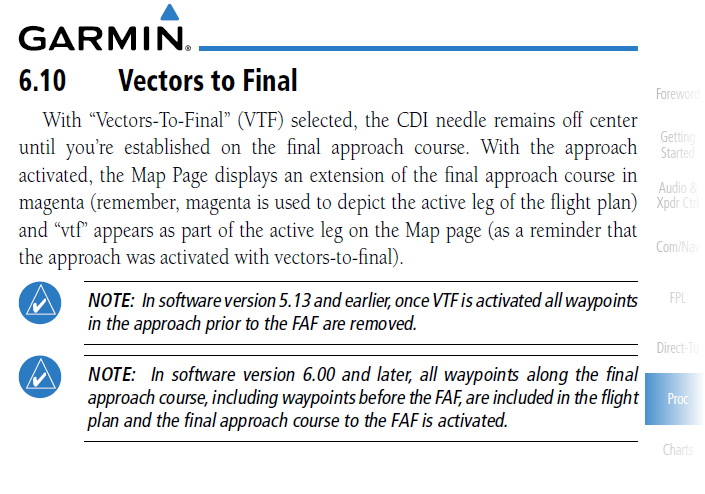 For that reason, like many instructors, I’ve long recommended against using VTF, especially because ATC can clear an RNAV-capable aircraft direct to an IF or to a fix between the IF and the FAF on any approach (again, see AIM 5-4-6). For more information, see also Flying Instrument Approaches without Activating the Approach here at my blog. The change in behavior in GTN units updated to system 6.x may change that recommendation, at least when flying some approaches. 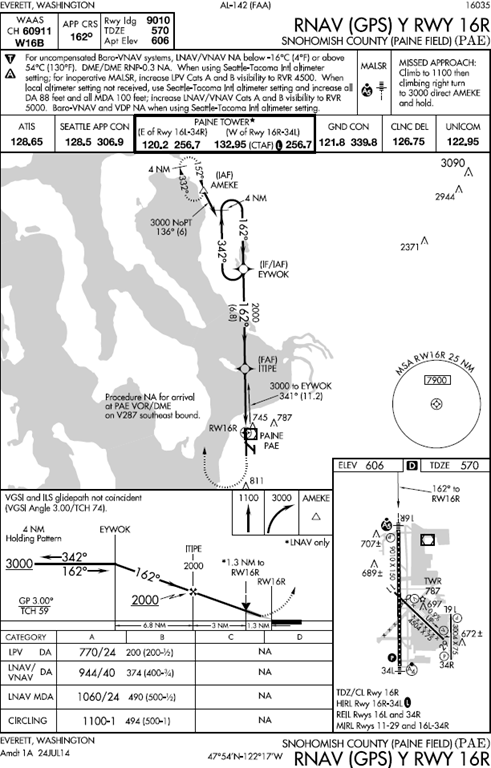 Consider the RNAV (GPS) Y RWY 16R approach at Paine Field (KPAE) north of Seattle, home of the Boeing wide-body aircraft factory that produces the 747, 767, 777, and 787 models. It’s a typical RNAV approach. 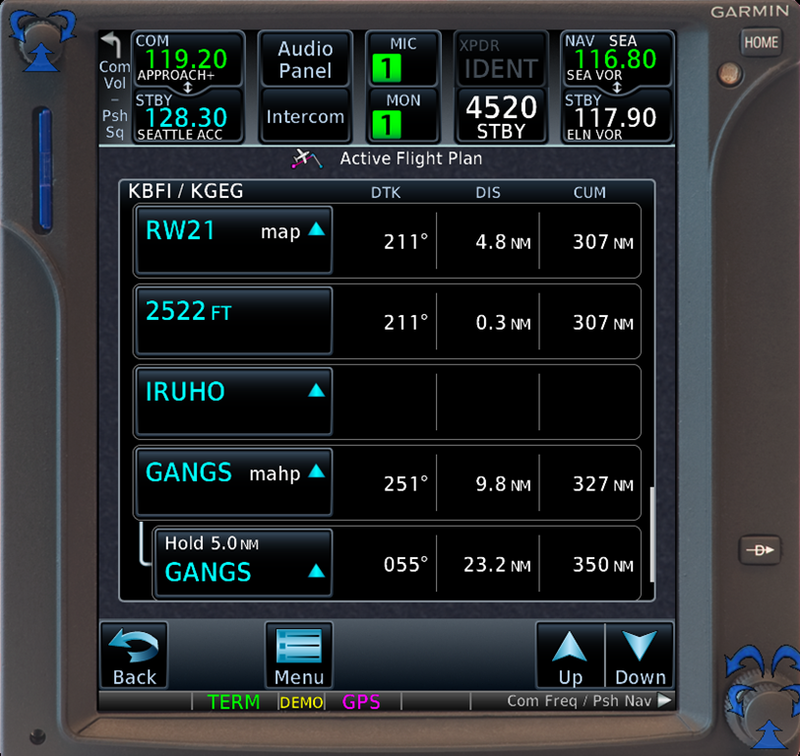 If you fly the approach with the current system software for a Garmin GNS or GTN navigator, selecting the VTF option removes all of the fixes except for ITIPE (the FAF) and RW16R (the MAP). 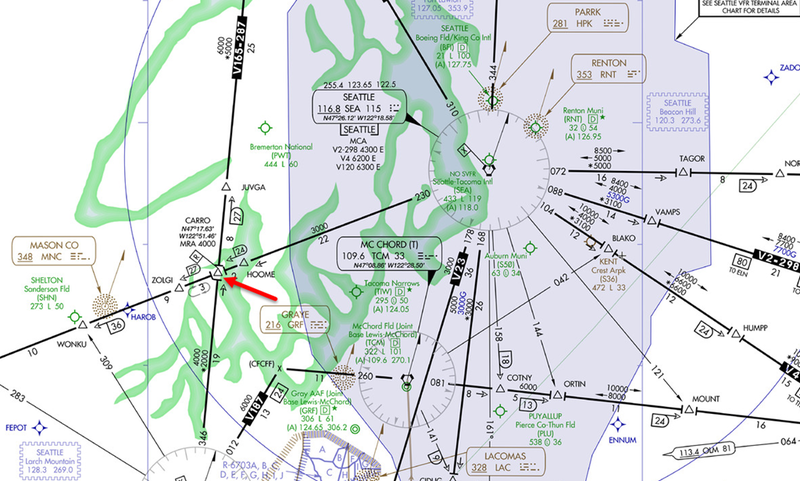 The map shows a magenta line extending from the MAP, through the FAF, and out along the final approach course north of the runway. If ATC clears you to EYWOK (an IF/IAF), you must reload the procedure and choose EYWOK as the transition (or ask for a new clearance). 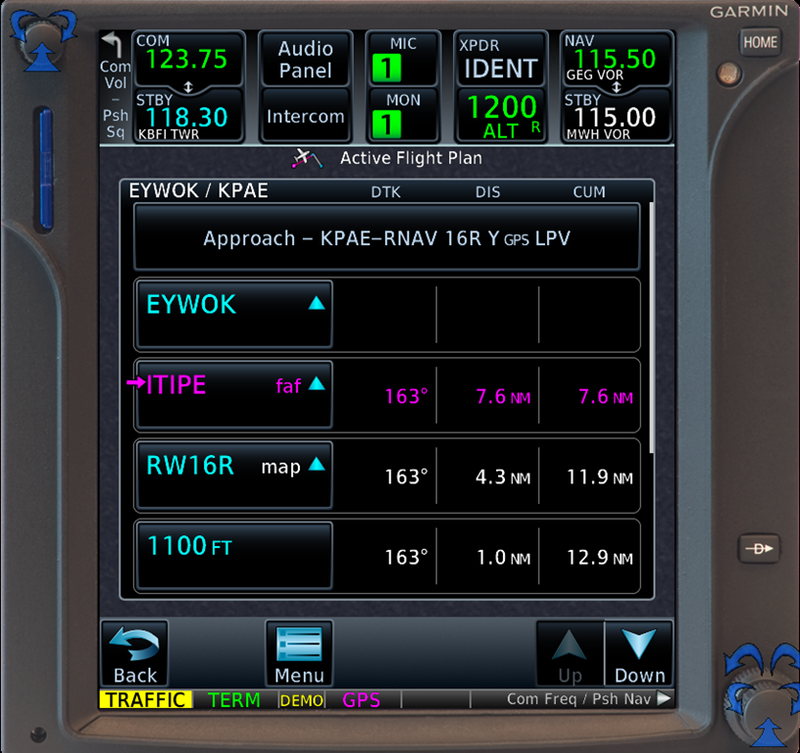 If you choose VTF in an updated GTN navigator, however, the new system software includes all of the fixes along the final approach course, from EYWOK to the MAP at the runway threshold. The FAF, in this case ITIPE, becomes the active waypoint in your flight plan. And the map shows a magenta line extending from ITIPE out to EYWOK, providing a reference as ATC vectors you to intercept the final approach course. 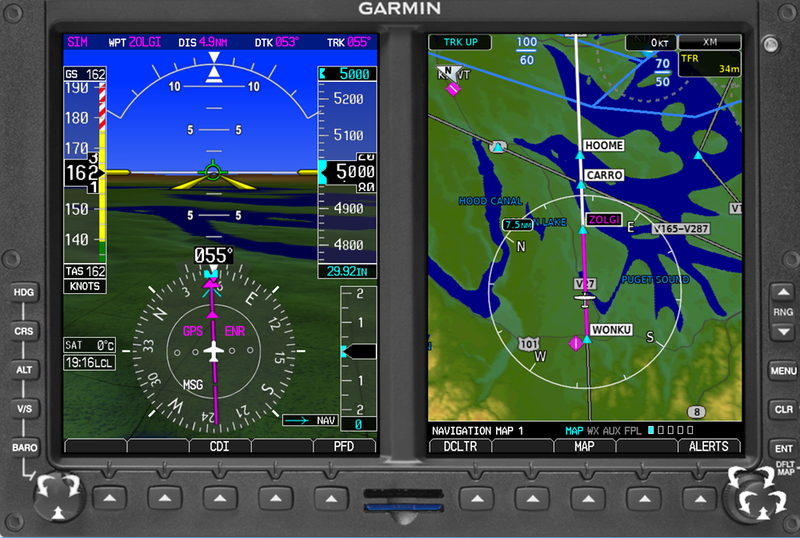 At this point, I’m still waiting for Garmin to release the new GTN system software and have it installed on my GTN 750. 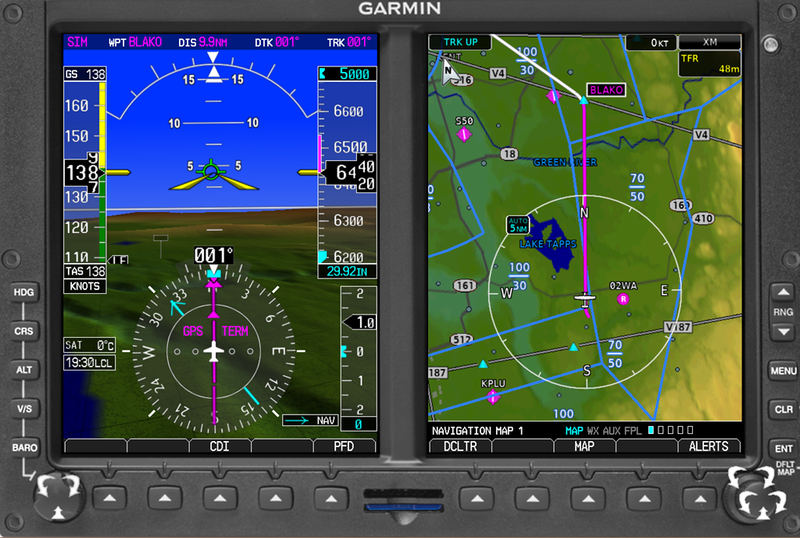 But my tests with the Garmin training software suggest that VTF may become a useful feature when flying some approaches. 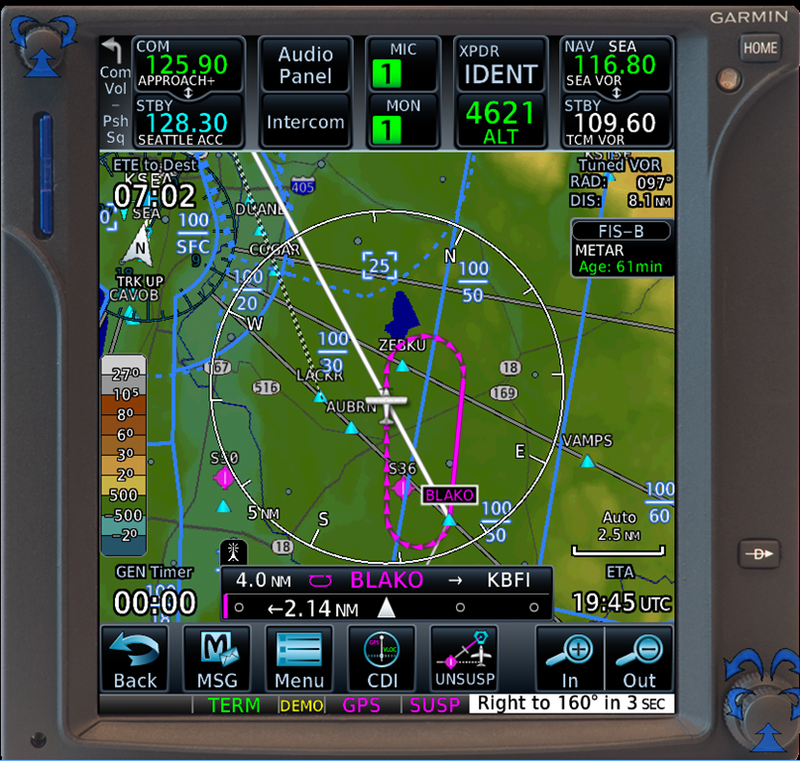 If you’re flying with current system software or with a GNS-series unit such as GNS 530 or GNS 430, however, you should follow the recommendation in the AIM and in Avoiding the Vectors-to-Final Scramble to help you stay ahead of the airplane—and your avionics–when flying approaches. 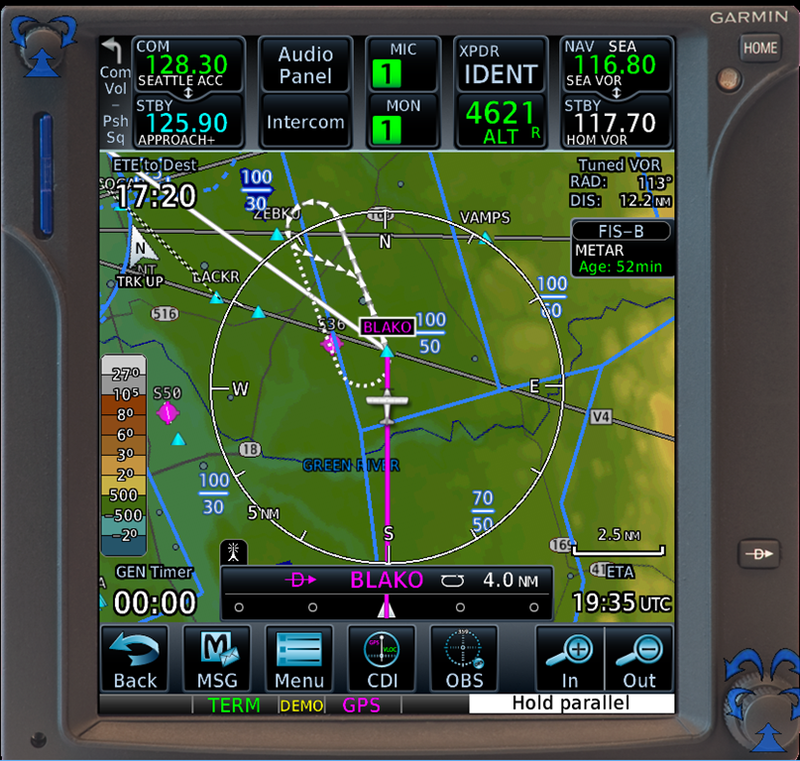 Garmin has released updated system software (version 6.11) for the GTN series of navigators. The software includes several new features. 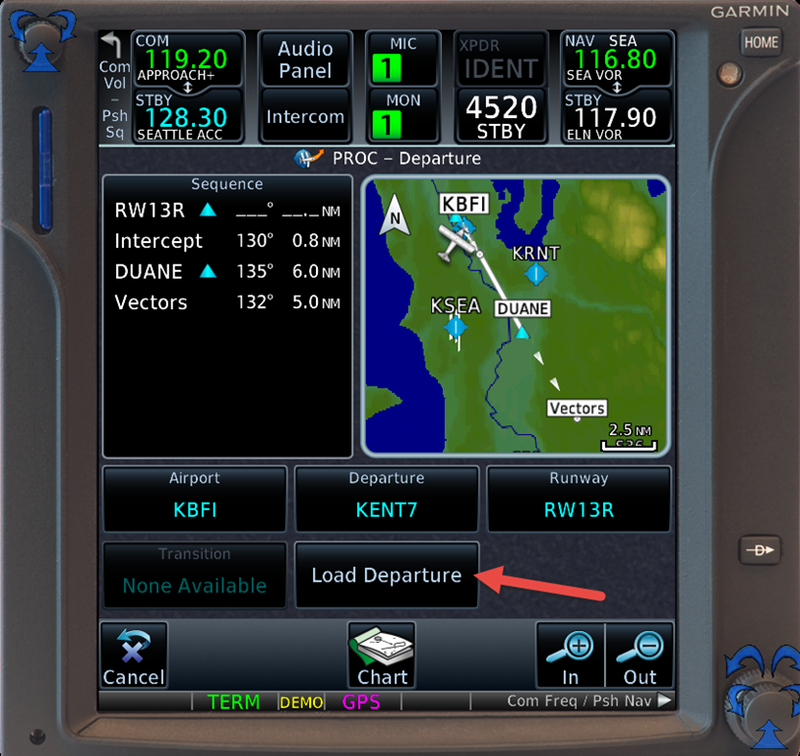 One of the most important changes, at least for day-to-day operations for typical general aviation pilots, is how loading (or activating procedures) affects departure and destination airports in flight plans (routes). 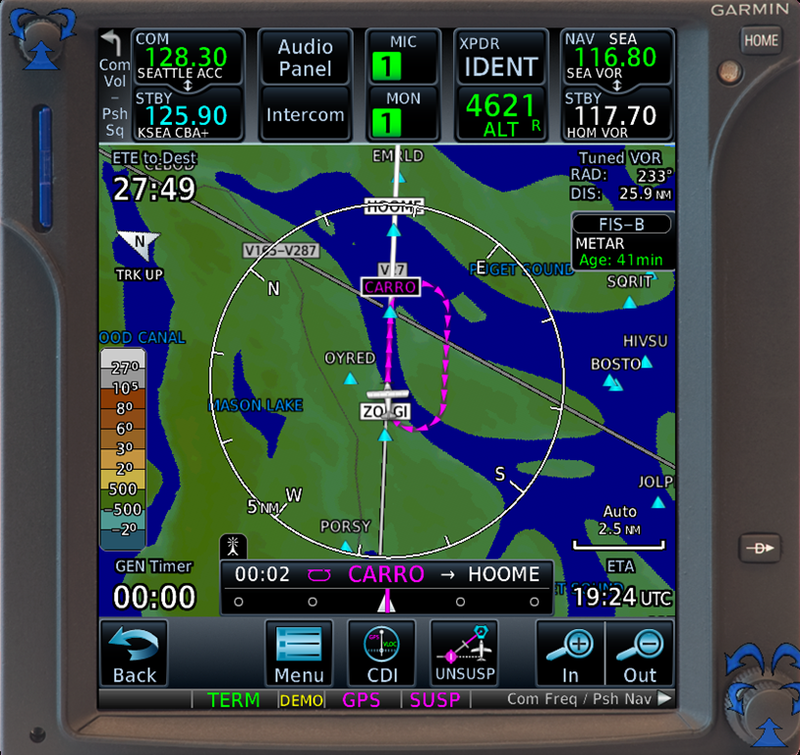 To learn about and practice using the new features, download the latest version of the free GTN 750 PC Trainer Lite from Garmin. 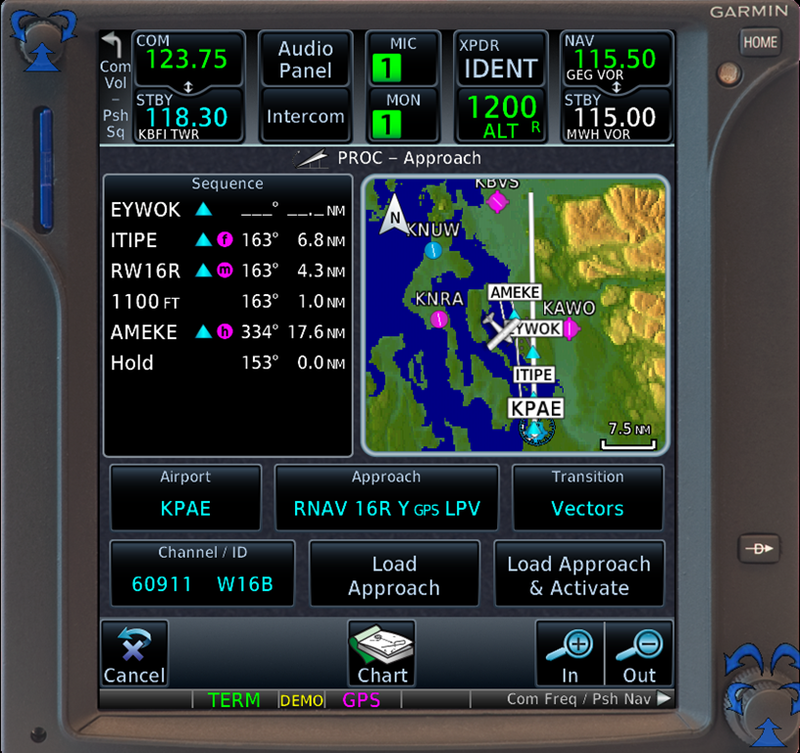 The download includes updated manuals (PDFs) for the GTN series avionics that describe the new features in version 6.x. 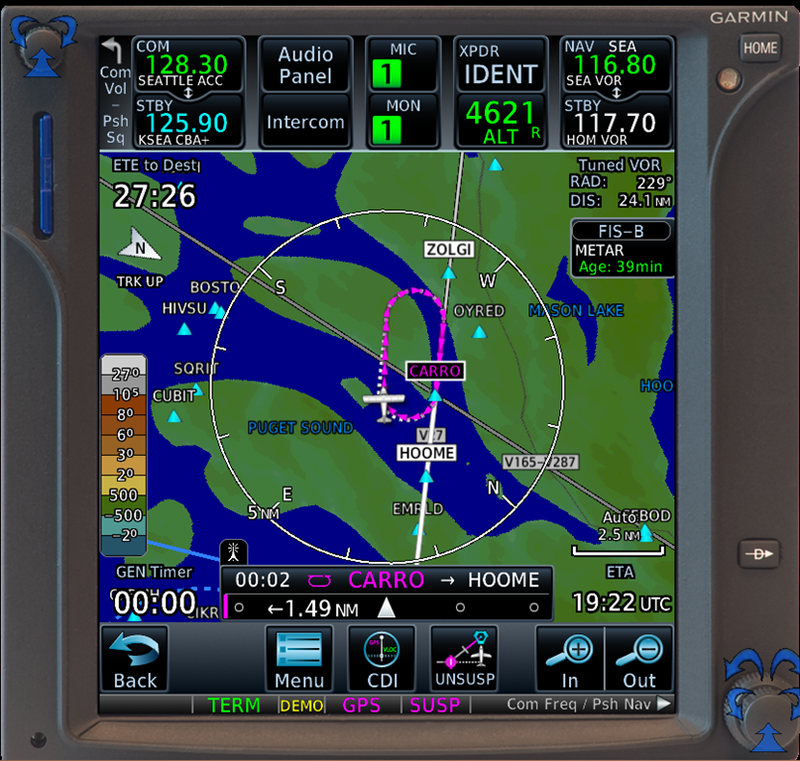 I have experimented with how the new system software in the free GTN 750 PC Trainer Lite available from Garmin, and the following examples illustrate the changes and offer suggestions to help you adapt your personal techniques for using a GTN-series navigator in the cockpit. In particular, I offer suggestions for displaying information about your destination airport (frequencies, current weather, and so forth). 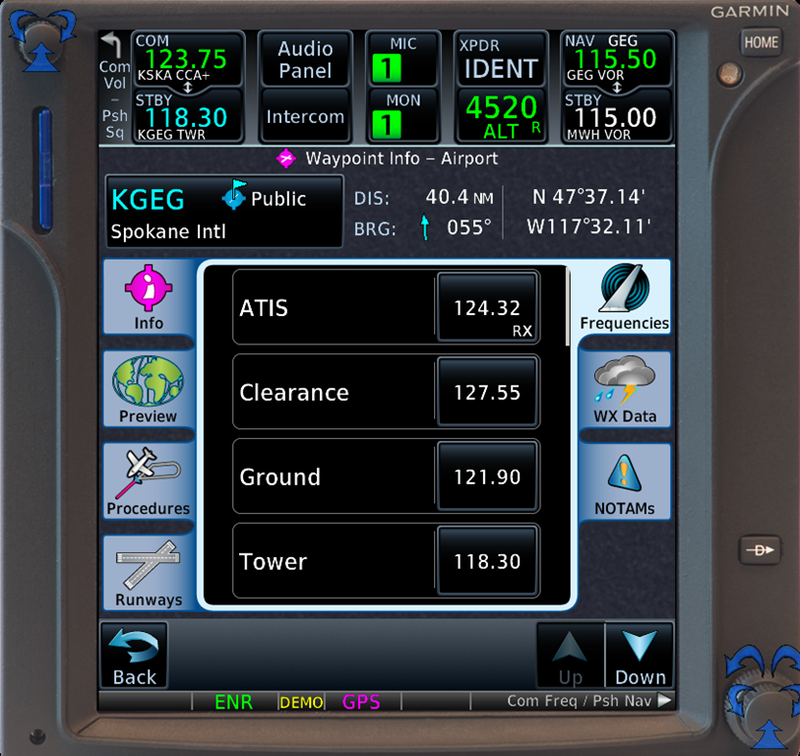 To learn about the new ad-hoc hold feature in the updated software, see Flying Ad-Hoc Holds with a GTN 750 here at my blog. 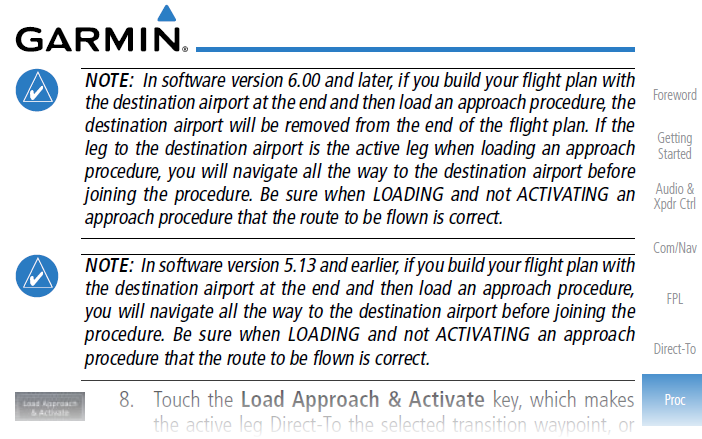 First, here’s a note in the updated Pilot’s Guide for the GTN 750 that describes how software version 6.x changes flight plans (routes) when you load an approach (or, it turns out, a departure procedure). Now let’s look at how this change affects when and how you load and fly a typical instrument approach. 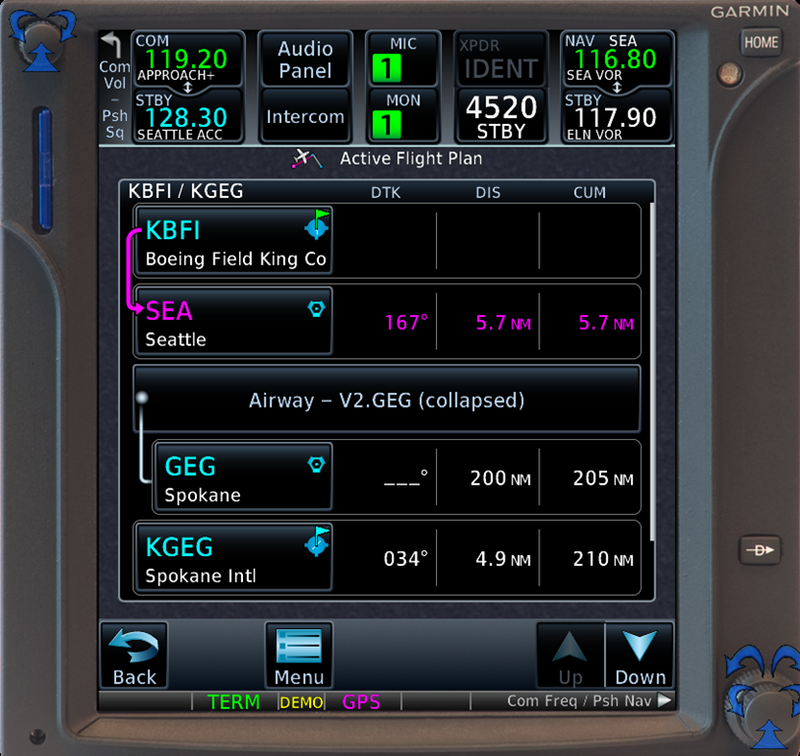 Suppose you plan to fly from Boeing Field (KBFI) in Seattle, WA to Spokane International Airport (KGEG) in eastern Washington. 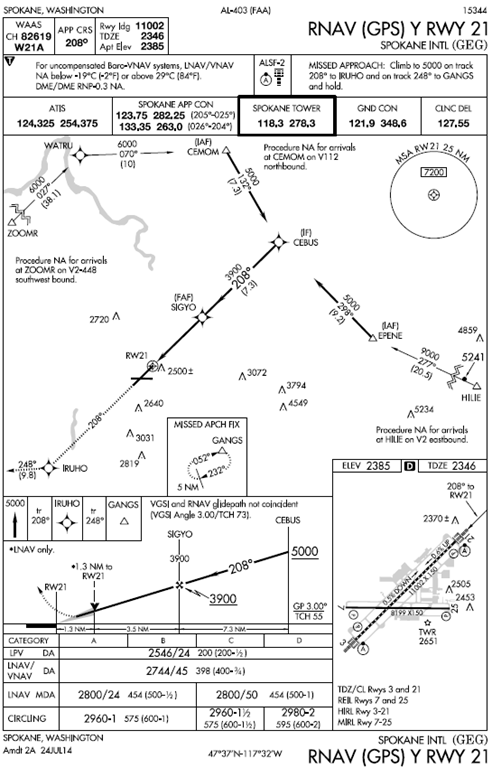 Here’s a route across the Cascades that I often fly in my normally aspirated Beechcraft A36. 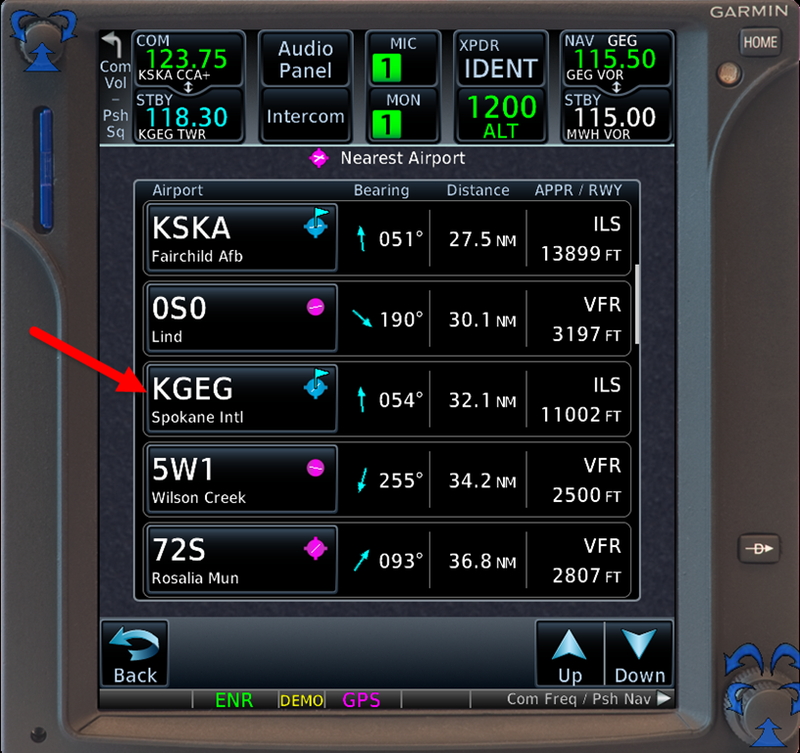 Note that the first and last waypoints in the flight plan are the departure airport (KBFI) and destination (KGEG). ATC typically assigns a SID when departing Boeing Field. 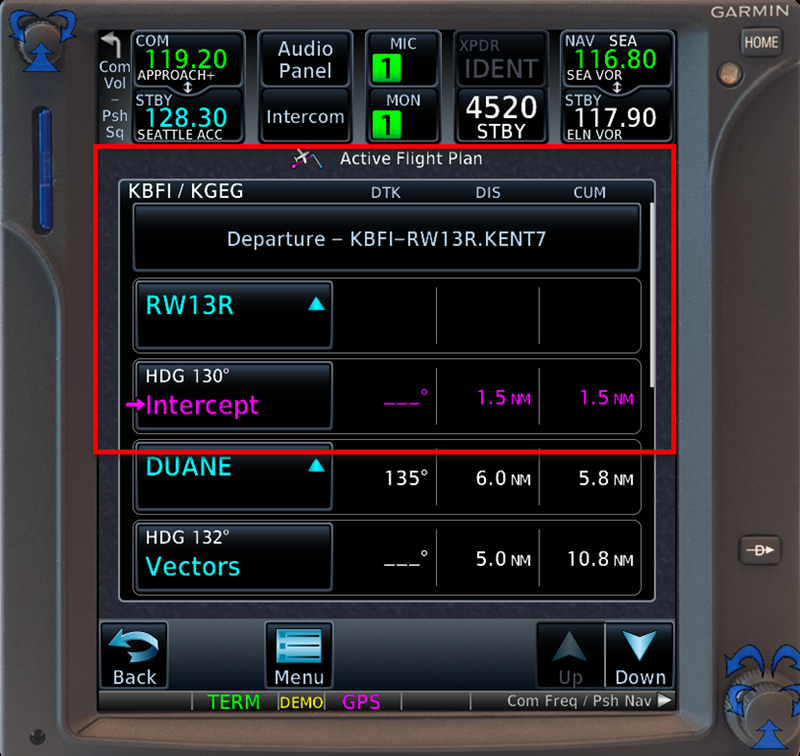 When runway 13R is in use for IFR departures, your clearance includes the KENT7 (or the current version) SID, which you load as follows. 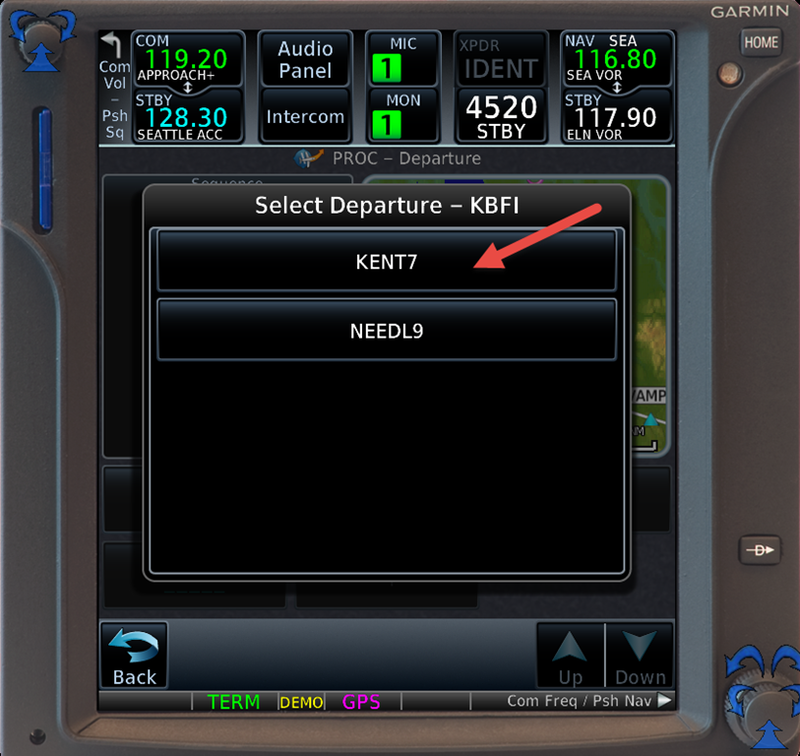 Note that after you load the departure, KBFI no longer appears as a waypoint in your current flight plan. 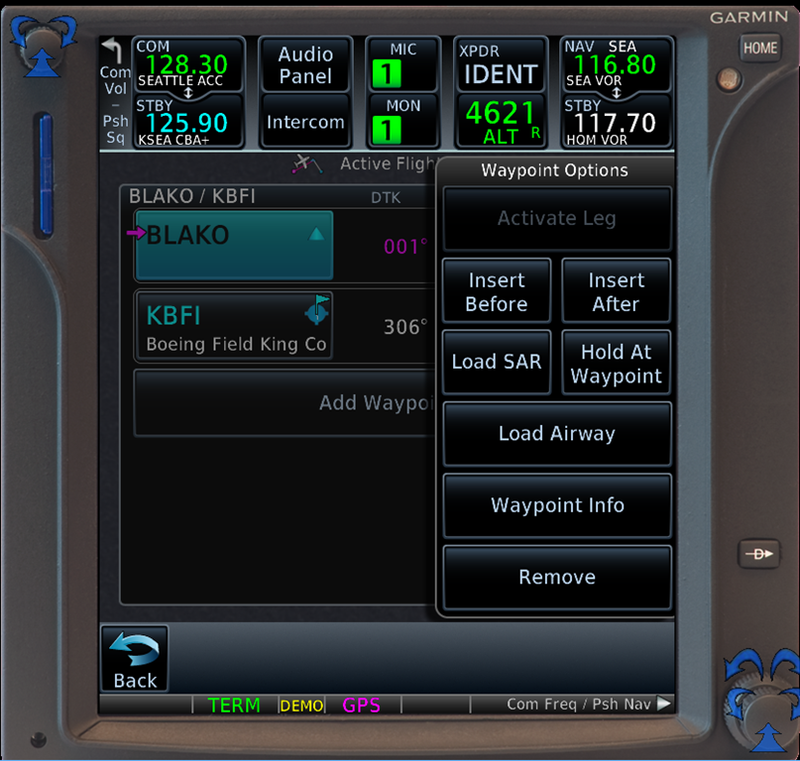 The first waypoint in the flight plan is now the runway ((RW13R), which is the first fix in the KENT7 SID. The IDs of the departure and destination airports, however, remain in the title of the Active Flight Plan. Here’s the first tip. If you use your GTN navigator to retrieve frequencies and other information about your departure airport, collect that data before you load a departure procedure. 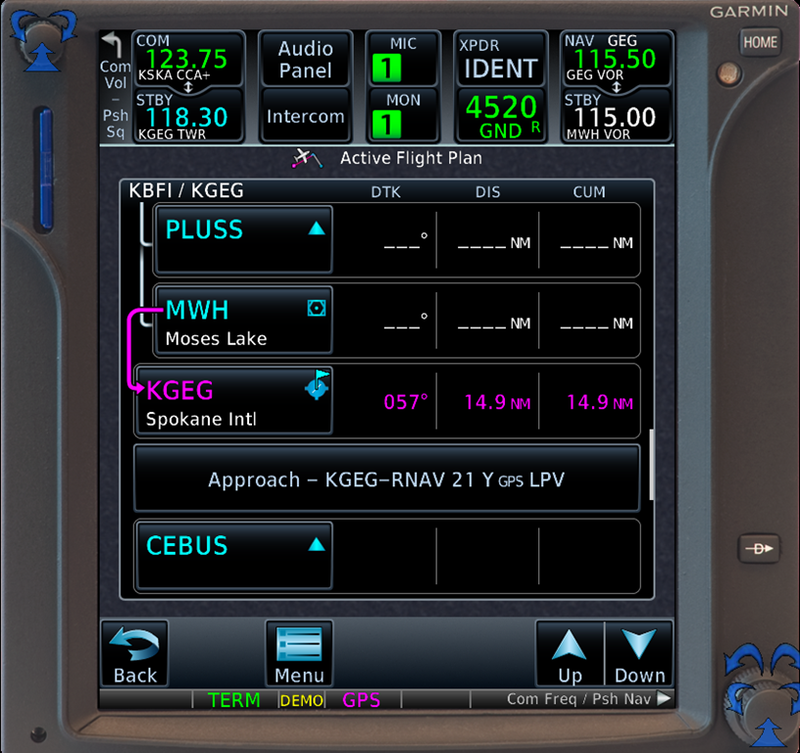 Now assume that you have departed KBFI, followed the SID and ATC vectors to join V2, and proceeded to a point west of Spokane where you are preparing for the arrival and approach at KGEG, say the RNAV (GPS) RWY 21 Y approach. 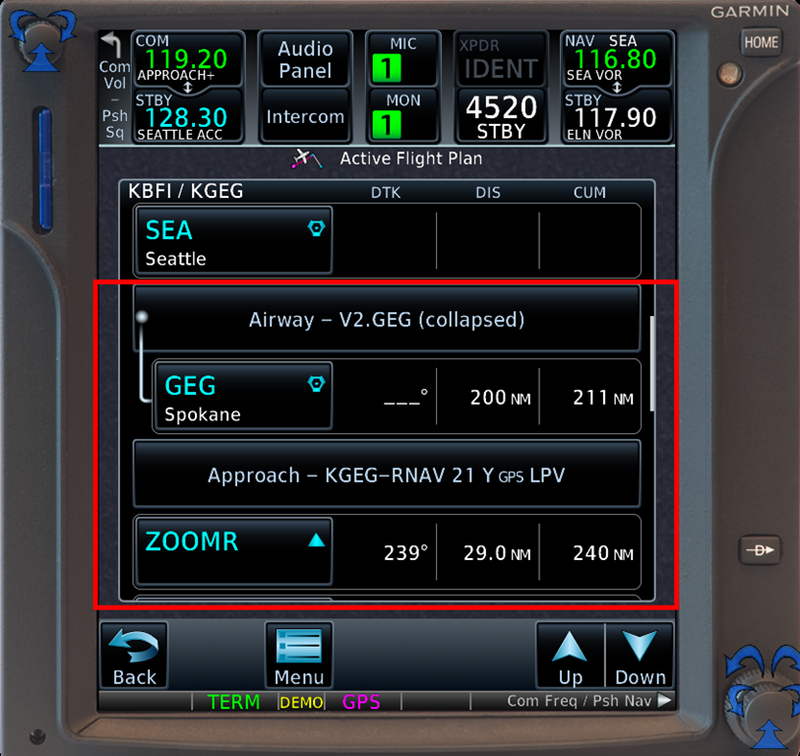 Given that you’re approaching KGEG from the west, ZOOMR is good fix to choose, at least initially, as the transition for the approach. ATC will probably provide vectors, but with all the fixes from the west now in the flight plan, it’s easy to accept a clearance direct to any of the fixes or legs along the path to the final approach segment. 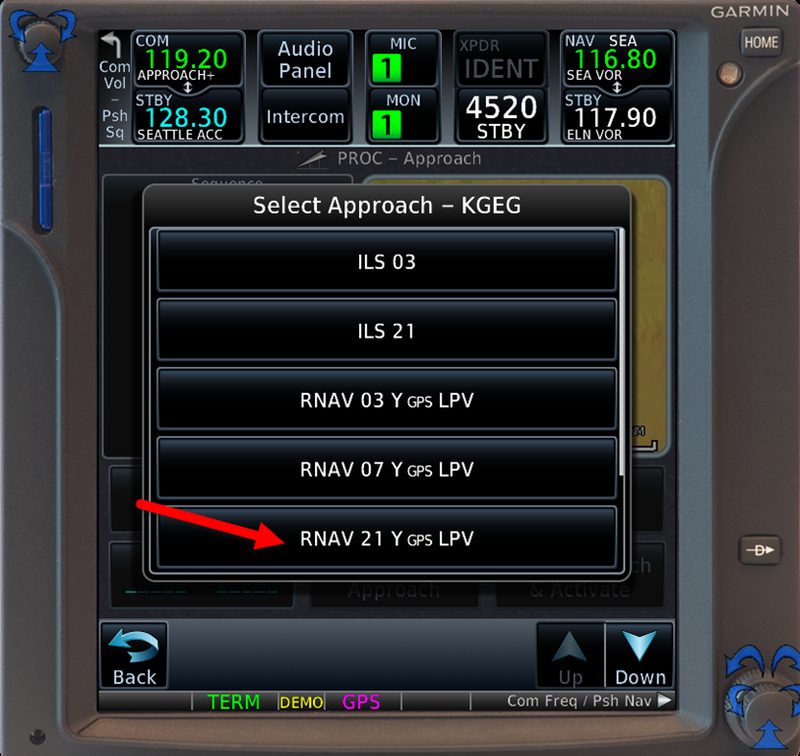 Notice that after you load the approach, the GTN removes KGEG from your active flight plan—unless the active leg of your flight plan includes the airport. Versions of the system software prior to 6.x always added the approach name and fixes for an approach below the destination airport. The change in behavior in version 6.x may disrupt your habits at first. But it also may reduce the potential for errors when you load and fly an approach (or DP) under typical circumstances. The new behavior provides a seamless transition from waypoints in en route section of your flight plan to fixes in an approach. You no longer have to scroll below the destination airport in the active flight plan list to select an initial fix or to activate a leg of the approach you’ve loaded into the GTN. The new behavior described above may lead you to change your basic technique for loading an approach. I have long advocated loading procedures as early as possible—even before taking off if the destination is nearby—to reduce your workload during busy phases of flight. The new behavior in GTN software version 6.x, however, suggests a change in tactics, at least under some circumstances. If you can determine well in advance which approach you prefer to fly—in-cockpit weather can give you an early alert about which runway is likely to be in use long before you can receive the ATIS or AWOS (that is, the one-minute weather at a non-towered airport)—then loading the approach you prefer or reasonably expect to fly is still a good idea. Just take a moment before you load the procedure to retrieve and note frequencies and other details about your destination airport from the GTN. If you prefer to wait until you are closer to the airport, or if ATC clears you direct to the airport or issues vectors before initiating an approach clearance, you can delay loading the approach. If you wait until the active leg of your flight plan includes the destination airport, the GTN adds the approach below the destination airport, just as it did prior to version 6.x. Or, as shown below, you can load a procedure early and then add the destination airport to the bottom of your current flight plan, so that the airport is still available as a reference and to provide easy access to the information about the airport in the GTN’s database. 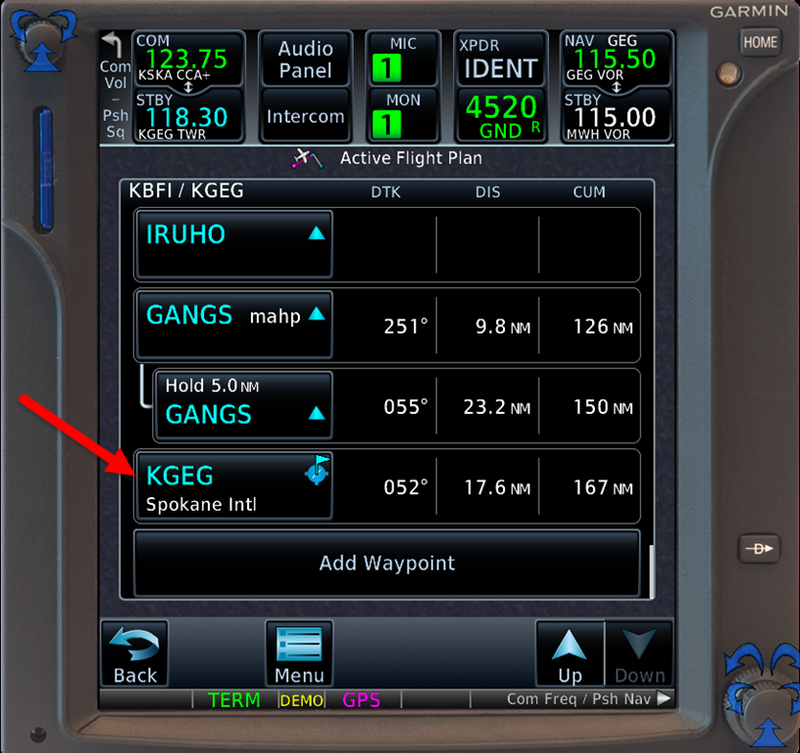 Here I’ve added KGEG below GANGS, the MAHP for the RNAV (GPS) RWY 21 Y approach. It’s easy, as before version 6.x, to touch the airport ID and then select Waypoint Info. 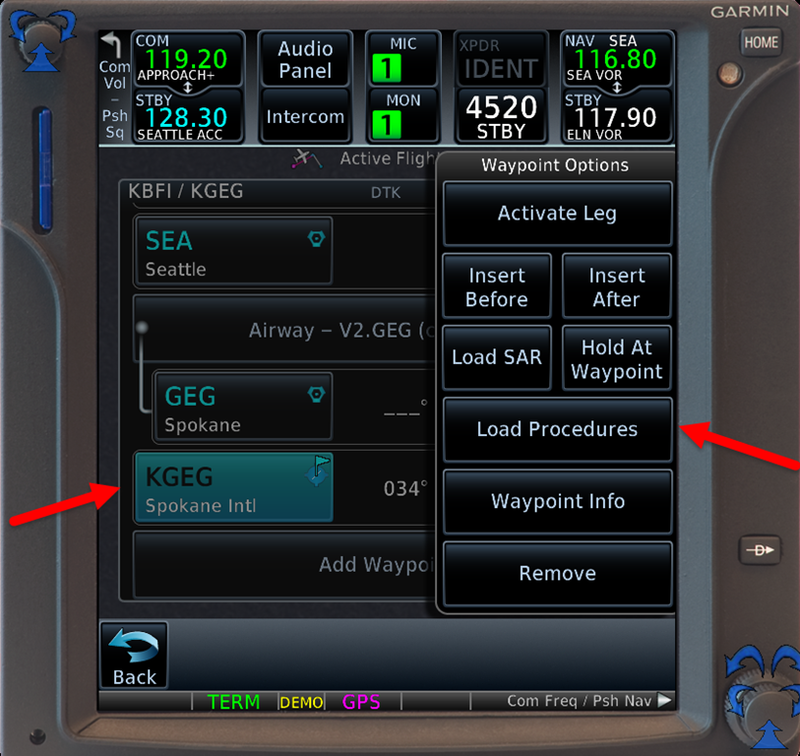 The change in version 6.x also simplifies adding an alternate to your flight plan. Suppose the weather at KGEG is close to minimums as you begin your arrival. Adding an alternate airport to your flight plan before you miss the approach could reduce your workload during a critical phase of flight. 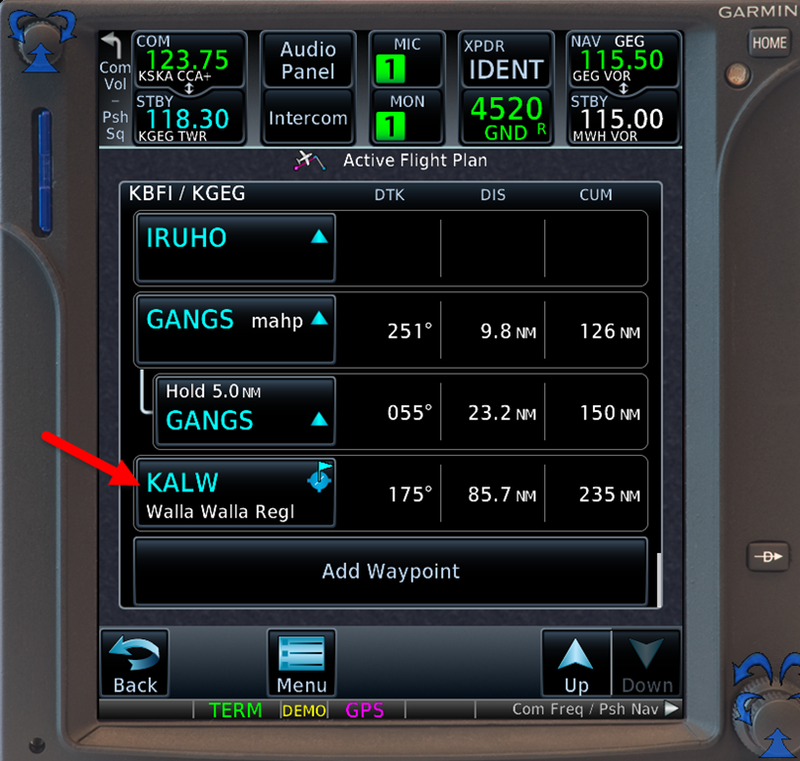 Here I’ve added Walla Walla, (KALW) as my alternate after the MAHP at GANGS. 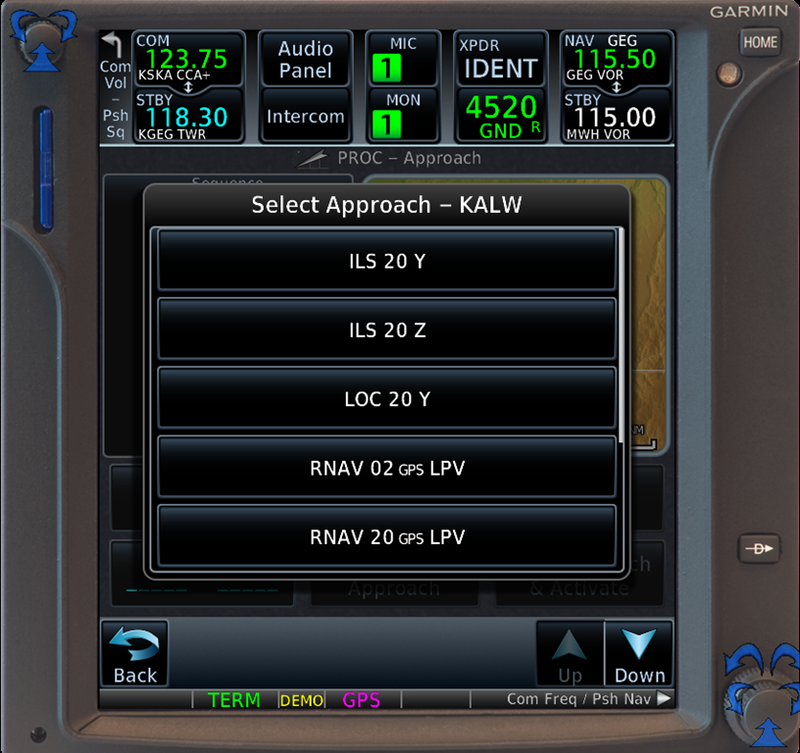 Now I can quickly retrieve information about KALW and even load an approach as soon as I get a new clearance from ATC. This technique would also be handy during training flights, when you fly several approaches, either to the same airport or close-by fields. If you prefer not to fuss with the way version 6.x handles airports in flight plans that include procedures, you can still retrieve information about airports from the GTN’s database, even if your departure and destination airports are no longer in your active flight plan. 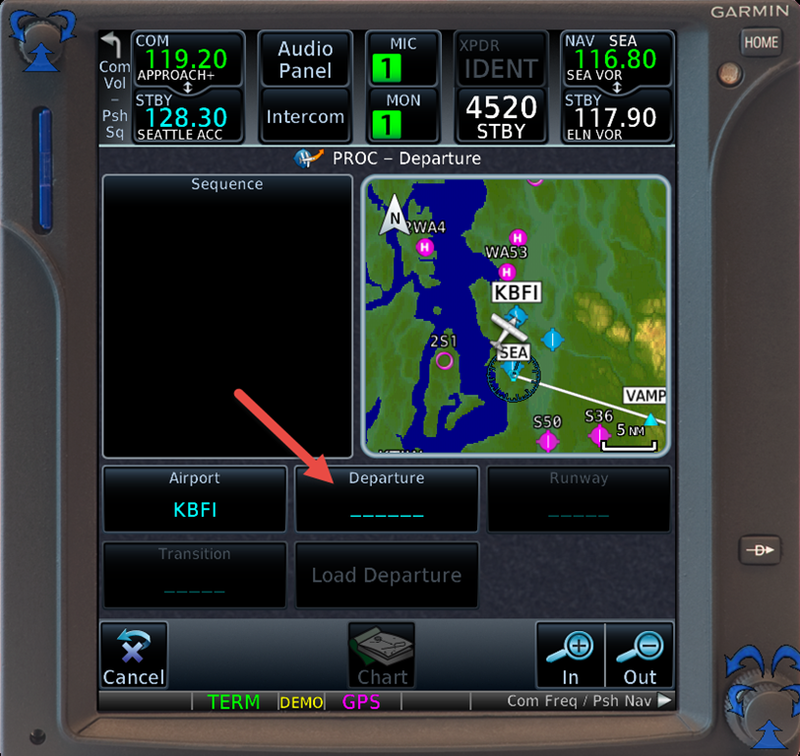 For example, touch the map, scroll to display an airport, and touch an airport symbol. Touch Waypoint Info to display details (frequencies, current weather, runways, NOTAMs, and so forth) about the airport. You can also use the Nearest Airport feature (available from the Home screen) to gain quick access to details about your destination—provided you’re not too far away. Or you can use the various search option in the GTN to find an airport and retrieve information about it. I’ll have more to say about the updated system software after I’ve had it installed in my airplane and explored the new features on test flights. Stay tuned. 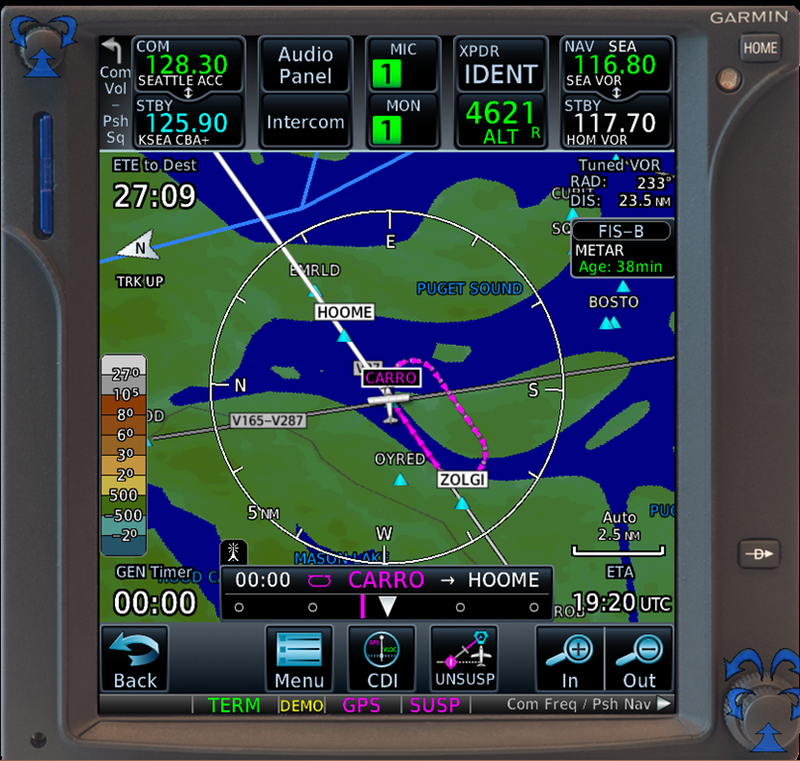 Garmin plans to release updated system software (version 6.x) for the GTN series of navigators in February 2016. The software includes several new features, including the ability to create an ad-hoc hold at any fix. I have experimented with the new holding features in the simulation, and it seems simple and intuitive. Suppose, for example, that ATC clears you to hold as published at an en route fix such as CARRO intersection, located southwest of Seattle along V27. 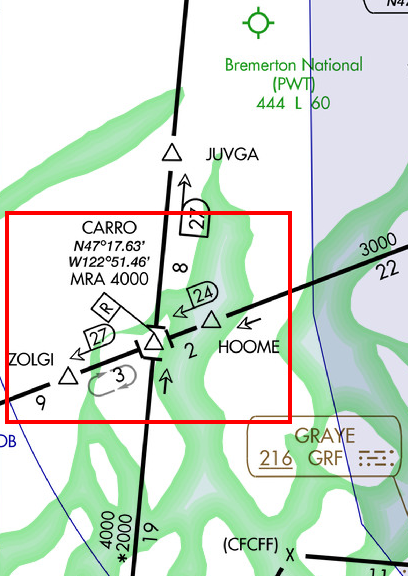 As this close-up view shows, a standard (right turns, one-minute inbound leg) holding pattern is charted southwest of CARRO at the 24 nm DME fix on SEA 230 radial (or the intersection of the SEA 230 and OLM 346 radials). That en route hold isn’t in the GTN 750 database, however (it’s not part of an departure, arrival, or approach). 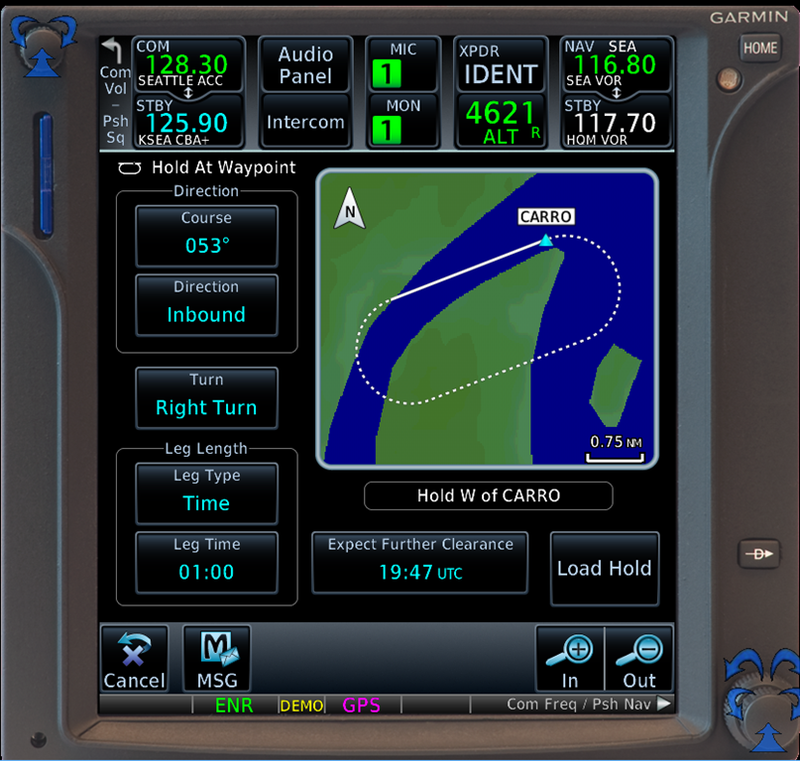 If you were flying along V27 with the current version of the GTN system software and instructed to fly the hold, you would proceed to CARRO, select the OBS feature, set the inbound course on your HSI to 050 degrees and fly the hold using the heading bug and a timer. The forthcoming software automates that process, as the following captures from the GTN trainer show. Assume you’re flying V27 northeast, toward SEA. 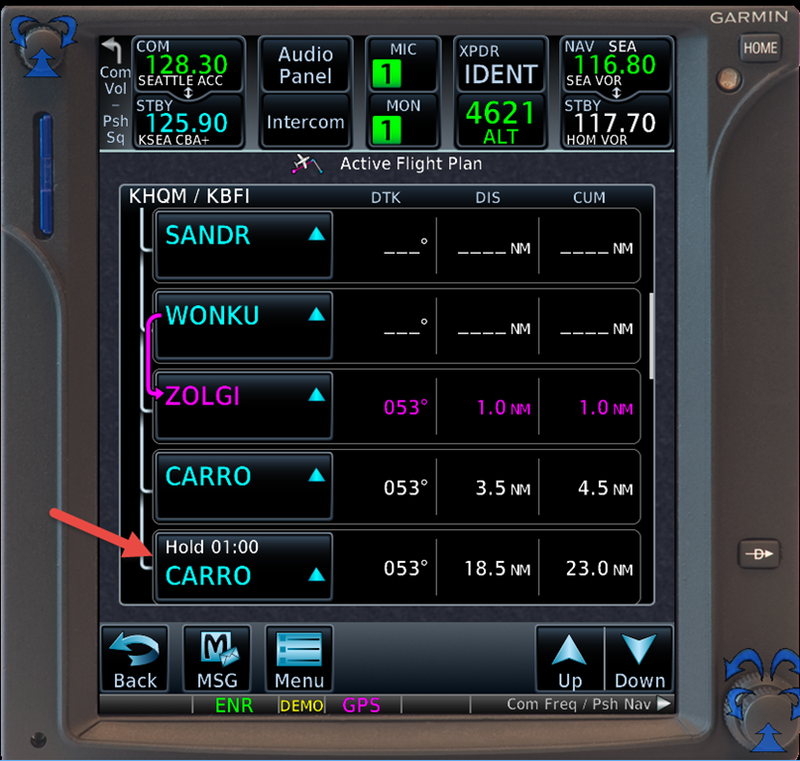 On the flight plan page in your GTN 750, touch CARRO (one of the fixes along the airway). The Waypoint Options menu appears. 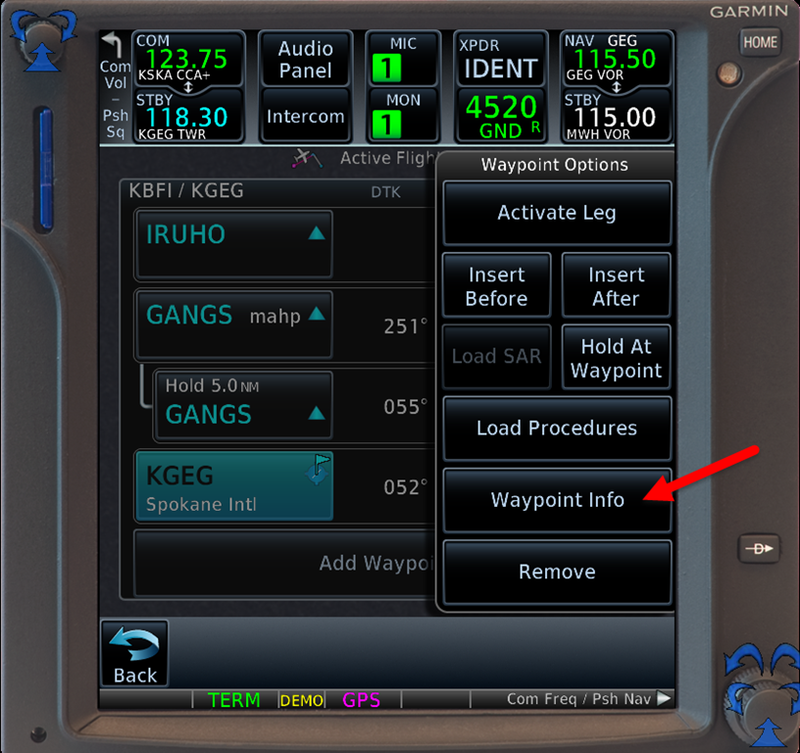 Hold At Waypoint is one of the new options. Touch Hold at Waypoint. The Hold at Waypoint menu appears. Touch the appropriate buttons (Course, Direction, Turn, etc.) in series to enter the information required to fly the hold as cleared by ATC. 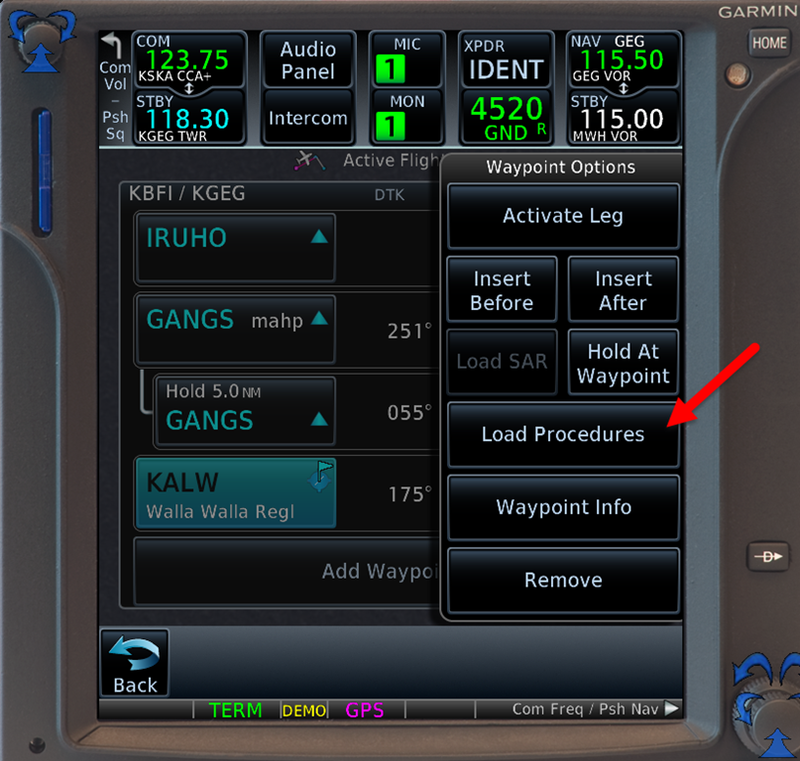 As you can see, the Hold at Waypoint menu includes options such as Direction (to specify either the inbound or outbound course to or from the fix), Leg Time (or Distance for RNAV or DME holds), Turn (direction of turns in the hold), and Expect Further Clearance time (which sets a reminder that will appear when the EFC time arrives). When you finish entering the required information, touch Load Hold. 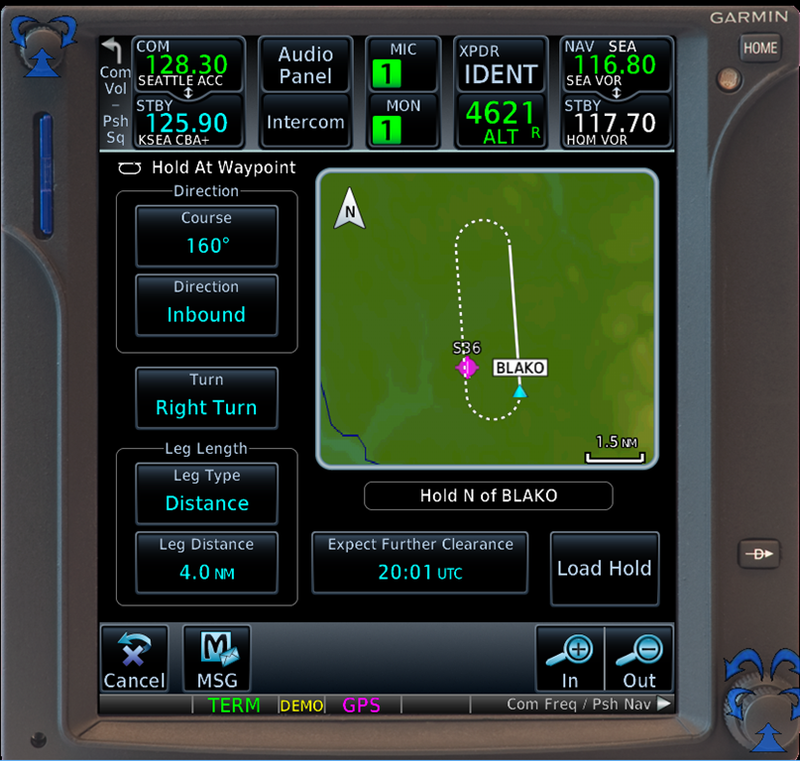 The GTN adds the hold as a waypoint in your active flight plan. When you return to the map screen, the GTN 750 shows the hold you created drawn on the map. 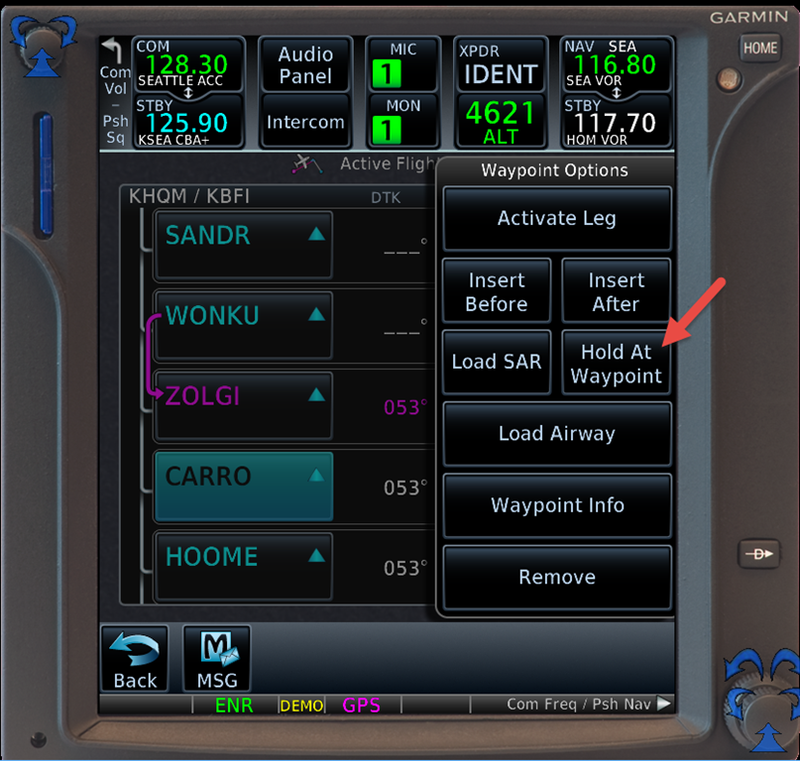 As you continue inbound to the holding fix (CARRO), the hold becomes the active leg in your flight plan, and, because this is a timed hold, an automatic timer appears on the CDI display. Note that GTN 750 enters SUSP mode as you enter the hold. And as you proceed outbound, the timer begins counting up as you pass abeam the fix on the outbound leg. The timer resets as you join the inbound leg. When you are cleared to leave the hold, touch the CDI display to return to the flight plan page, select the next fix in your route (or enter a new fix, depending on your clearance), and proceed. The GTN 750 switches out of SUSP mode and resumes normal waypoint sequencing. The preceding example shows how to add a published hold along an airway to a route. Now let’s try a true ad-hoc hold at a fix specified by ATC. Assume you’re southeast of Seattle, heading roughly north en route to Boeing Field (KBFI). ATC clears you to hold at BLAKO intersection, as shown below. Your instructions are to hold north of BLAKO on the 340 degrees course (160 degrees inbound), 4 nm legs, right turns, with an EFC of 2001 UTC. 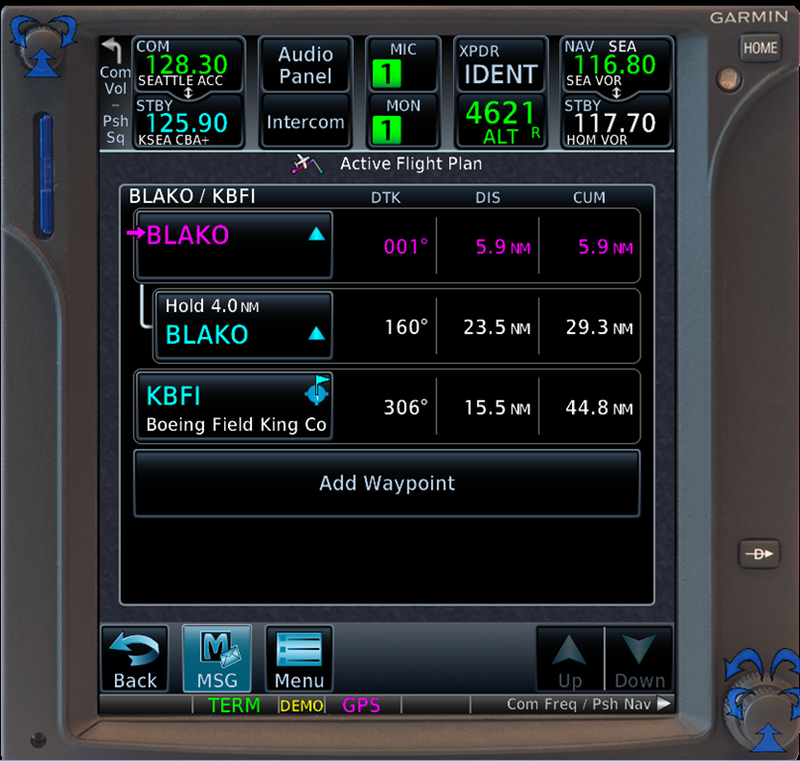 On the flight plan page, add BLAKO as a waypoint (if it’s not already in your flight plan), and then touch BLAKO to display the Waypoint Options menu. Touch each option and fill in the appropriate information to specify the hold. Then touch Load Hold. And on the map, complete with the recommended entry procedure. 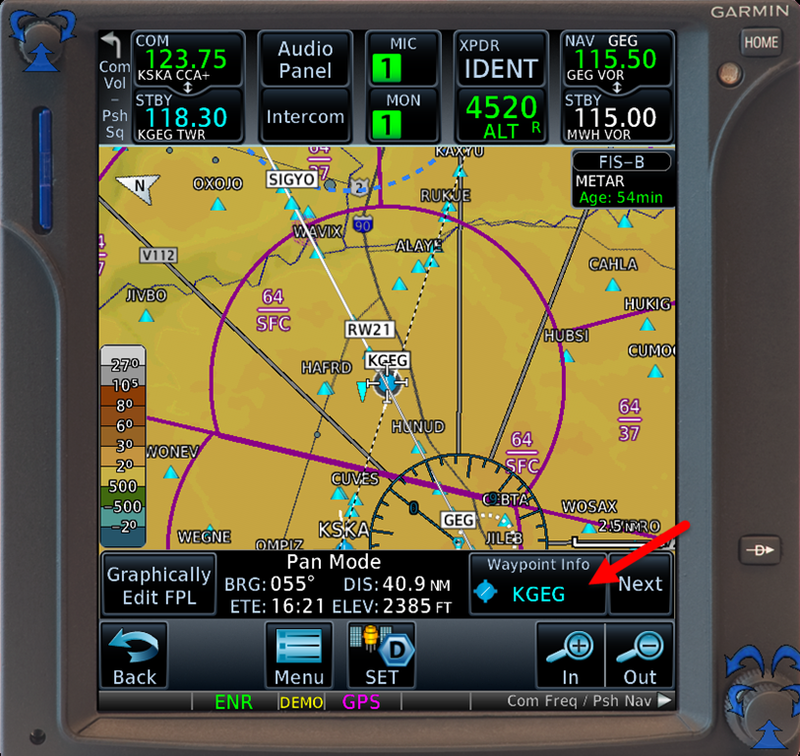 If your GTN 750 is connected to an autopilot with GPSS capability, the autopilot can fly the entire hold, including the entry. Because this hold is based on distance, not time, the GTN 750 doesn’t show a timer on the CDI. Instead, it prompts you to turn inbound at the appropriate distance outbound from the holding fix. 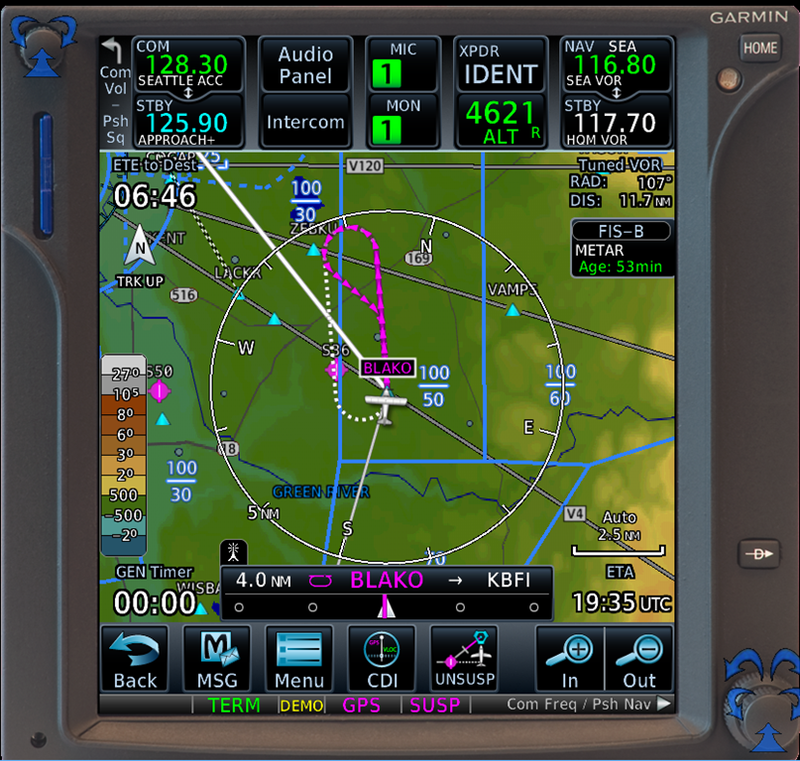 I look forward to updating the GTN 750 in my Bonanza. I might even look forward to flying holds.